As most of you know, I LOVE Kevin Smith movies. The man is a linguistic genius and I never get tired of anything Kevin Smith or especially Jay and Silent Bob related. 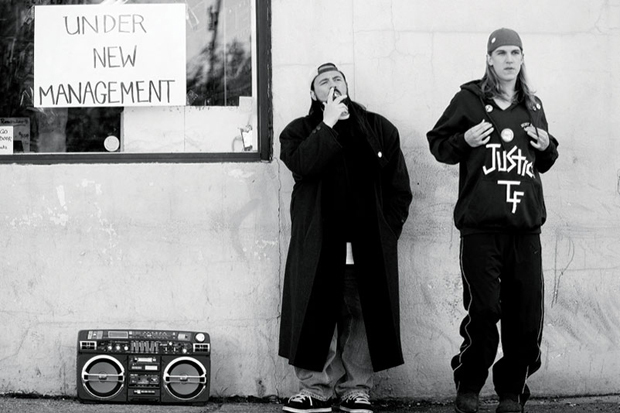 Plans were made for the man to begin filming the ending of his trilogy of ‘Clerks‘ in May. Unfortunately for us…and the world as a whole, this is not meant to be at this time. Smith gave a statement that The Weinstein Company, who own the rights to the franchise, passed on the sequel. There is no way they could have heard him correctly! This is ‘Clerks’ to the third power! Not some lame and sappy romantic piece of shite, this is freakin’ ‘Clerks’!!! Smith said “[The Weinsteins] passed, “I went in with a $6 million budget and they were like, ‘Oh no, Kevin. This is too high.’ Bob offered us distribution, but they weren’t going to finance it.” ‘Clerks II‘ reportedly cost $5 million to make and grossed $24 million Stateside in wide release. The original pic was shot with less than $30,000 and earned $3 million in its limited release. For the Weinsteins, the budget is pocket change compared to the cash this man has made for them! I don’t care if Smith wants to put Jay and Silent Bob at the very first all-naked clown convention on Venus with a diamond smuggling monkey, you give the man financing to make his freaking Swan Song with Jay and Silent Bob!!!! On March 8, 2013 Kevin Smith posted a photo of the cover of the first draft of Clerks III. The caption read: “THE BEGINNING OF THE END. 20 years ago today, we started shooting CLERKS. 20 years later, with no plan or provocation, I jumped out of bed at 4:20 this morning and started writing CLERKS III. It’s been like hanging out with old friends. And after 2 hours of tapping the keys and giggling, I have come to a conclusion… CLERKS III will be the best film I’ll ever make.” I have to see the bromance in action one more time on a ‘Clerks’ platform. I’m not giving up on ‘Clerks III‘! Who’s with me?!?! This entry was posted on Tuesday, July 8th, 2014 at 10:14 pm	and is filed under Film, News. You can follow any responses to this entry through the RSS 2.0 feed. You can skip to the end and leave a response. Pinging is currently not allowed. « First Look At Ridley Scott’s ‘Exodus: Gods and Kings’!! !